Men’s multivitamin with guranteed potency probiotics. Enzyme Nutrition for Men contains Enzyme Activated Nutrients™ (EAN) as part of a whole food matrix. It is personalized to meet the unique needs of modern men. Each ingredient is grown to preserve the highest potency of enzymes contained within the food structure. Additional enzyme blends (Thera-blend™) enhance the utilization of vitamins and minerals ensuring the products are easily digestible while maximizing their ability to support heart health, increase energy and support immune function. 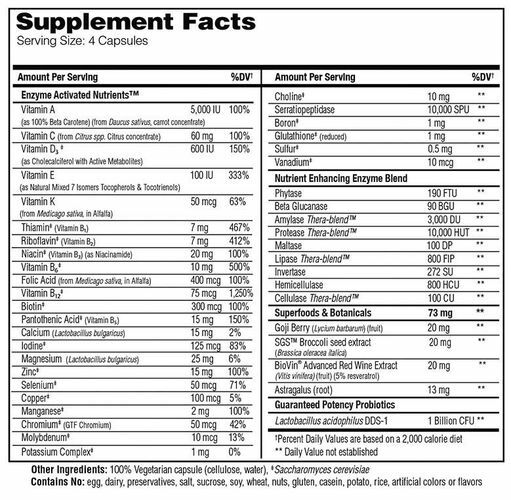 Enzyme Nutrition™ Formulas contain Enzyme Activated Nutrients™ (EAN) as part of a whole food matrix. It is personalized to meet the unique needs of men, women and families. Each ingredient is grown to preserve the highest potency of enzymes contained within the food structure. Additional enzyme blends (Thera-blend™) further enhance the utilization of vitamins and minerals. This ensures that the products are easily digestible while maximizing the ability to support overall health. Enzyme Nutrition™ is the only multi-vitamin – powered by enzymes. © Copyright 2019 Professional Supplement Center, LLC, 5441 Palmer Crossing Circle, Sarasota, FL 34233. All rights reserved. Local time is 4/25/2019 2:13:11 PM.